Amanda Murphy Design: Flower Power! I can finally show you all one of my favorite projects that I have ever made! Introducing Flower Power! 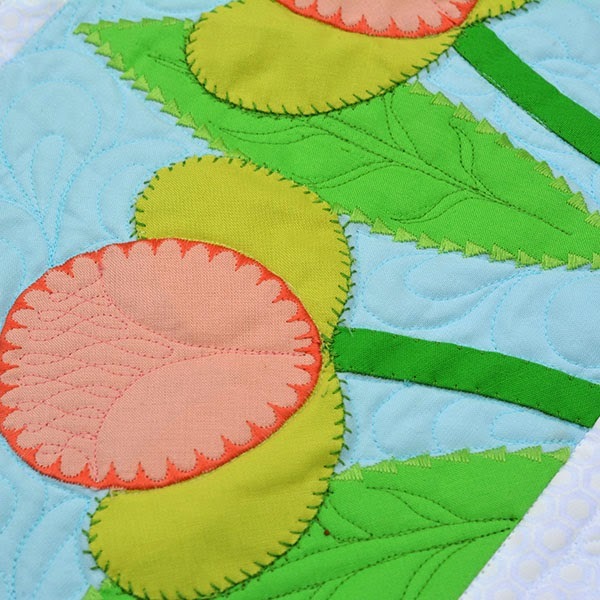 It is appliqué in a modern style and is unlike anything I've done to date. I think I channeled my inner Brady Bunch (does that date me?) 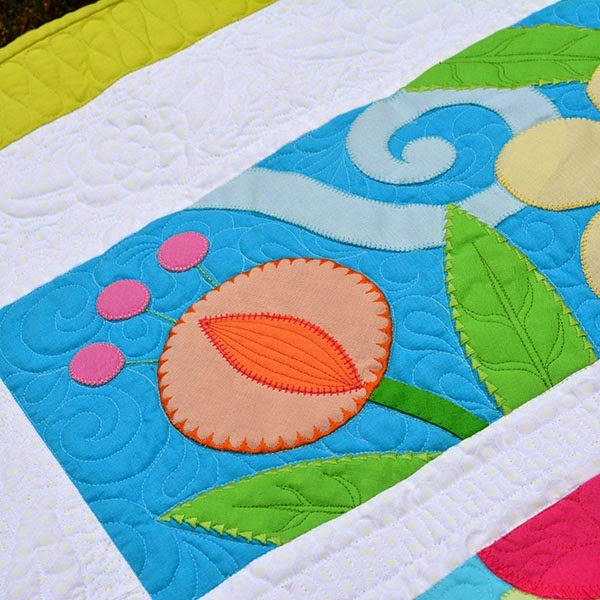 but it is such a cheery quilt and I love how it turned out!. I used Kona solids from the Sunrise fat quarter palette and added in the aquas. (I listed the particular solids in the directions.) 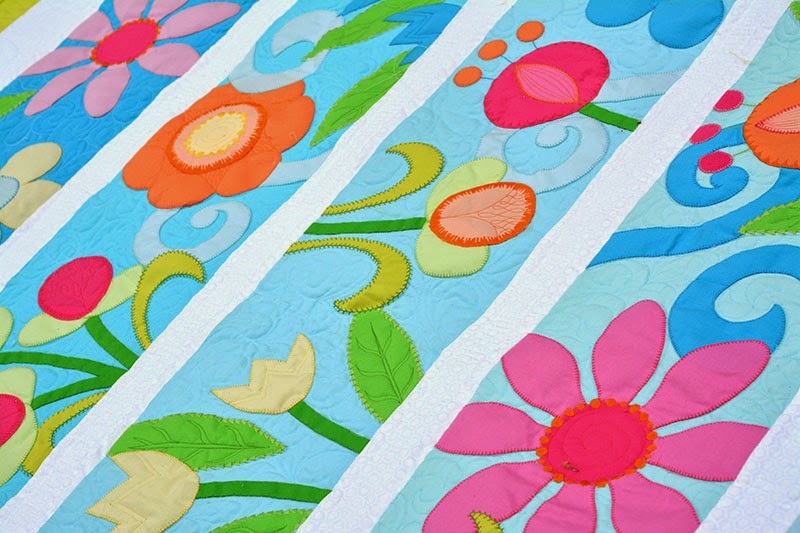 Did I mention the blooms are fat-quarter friendly, whether you use solids or prints? 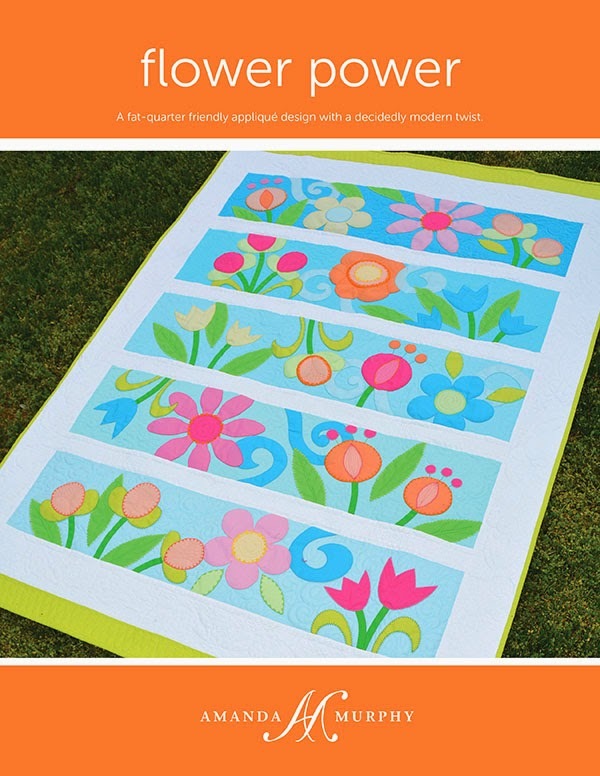 The retail price of Flower Power is $19 and all placement diagrams are included true to size so your quilt will look just like the original. The appliqués are huge so it goes together quickly! Best of all, I've made all the SVG files available free on my website so using your favorite fabric cutter is a snap! 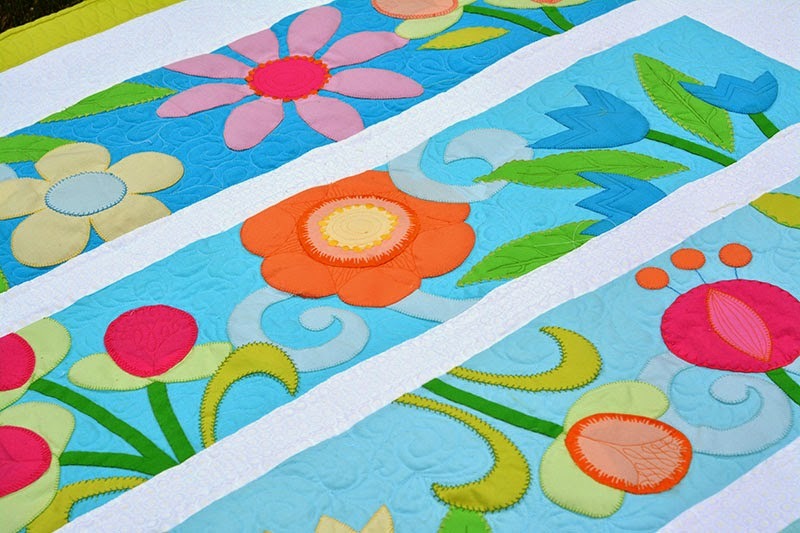 For quilt shops - Flower Power is now on its way to Brewer, Checker, and United Notions, so you can order it everywhere. (And you can see it in Brewer's booth at Market.) You can also order it by emailing me. I'm missing Market this time due to a family commitment but I want to be sure to celebrate Flower Power's debut so let's have a little sale, okay? 20 percent off all patterns (PDF and printed) in my shop through this Sunday night, including, but not limited to, Flower Power. Use the promo code FLOWERPOWER. 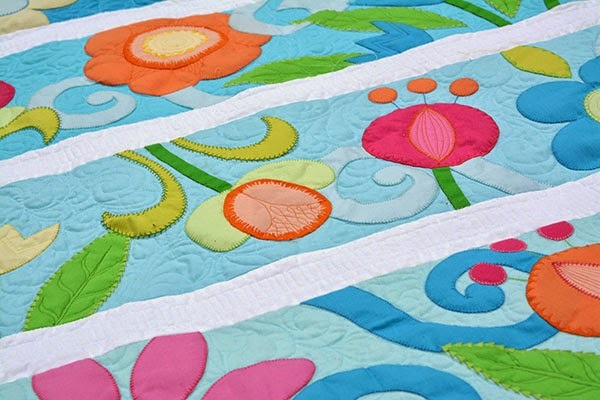 What a beautiful colourful quilt! My youngest niece would love this! I love this, it looks like a folk art, modern whimsical mashup, what a great teen quilt, you do not find many of those. Thanks for sharing. Beautiful work and fresh colors! Wow! With imagination! Flowers are beautiful, but the stitch makes them even more beautiful. 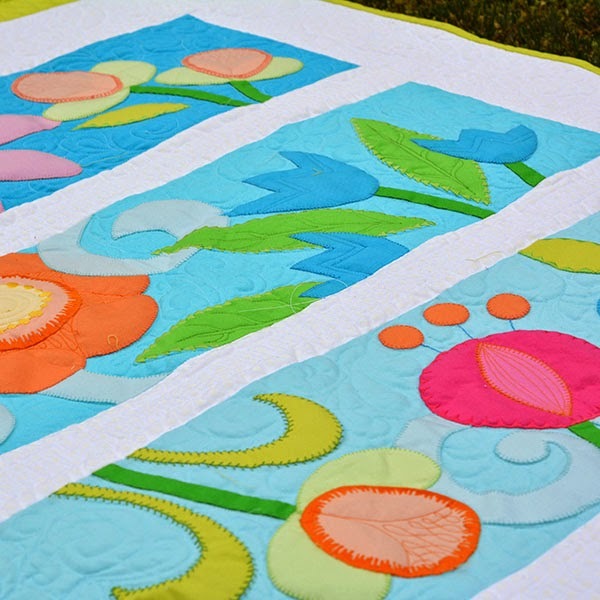 I love that you channeled your inner Brady Bunch as you worked on this quilt. It's really fun and I love the bright colours you've used. Love this quilt! So SO darling!!! Love it, so beautiful, i love the way you have chosen the right stich to each flower, well done!. Fresh and colorful! I love it! This is a pretty quilt. I'd love to see some mention of size. 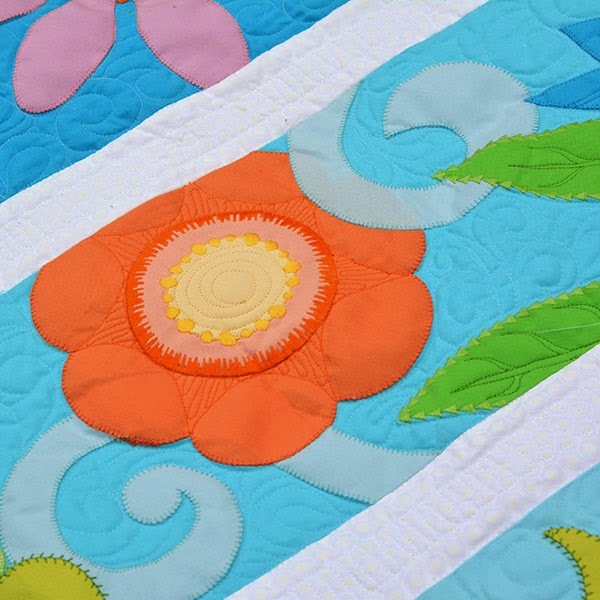 I love this cheerful quilt. Beautiful! I love the bright colors! Flowers are my favorite, and yours is beautiful! Quite the happy quilt. Love it. 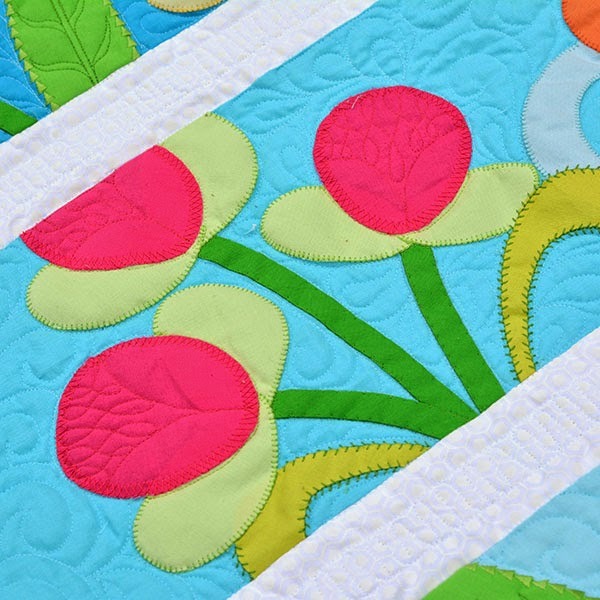 The design of this caught my eye right away at the Blogger's Quilt Festival! Beautiful and great for beginners to machine applique, but fun for more experienced stitchers who want to get fancy with their stitching.